With its great acid jazz soundtrack, it’s no wonder Persona 5 works so well as a rhythm game. 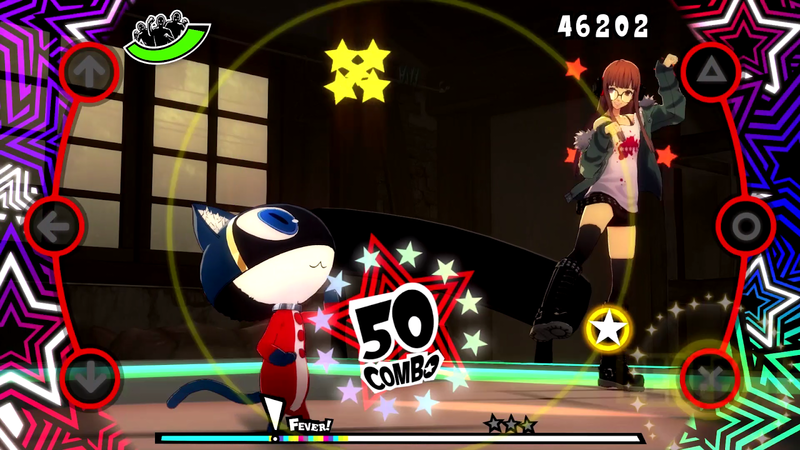 Persona 5: Dancing in Starlight features the already great involved rhythm game mechanics from its predecessor in a familiar form with an updated UI alongside the characters of Persona 5 showing their personalities in dances. While it’s new event-based story mode sets it apart from the last Persona Dance game, there are many events to unlock, on top of costumes, fun challenges and ways to shake up both its core gameplay and its social aspects to keep Persona fans busy. If you like rhythm games and Persona 5’s characters and music as much as I do, Persona 5: Dancing in Starlight is worth a look for story and rhythm game fans alike. If you’ve played Persona 4 Dancing All Night, you’ll recognise and pick up the rhythm game system in Dancing in Starlight quickly since the core systems are almost identical. It features the familiar circular rhythm system from Dancing All Night that uses a combination of button presses and stick flicks to play rhythms to the beat of each song. There are a few different note types to keep things interesting, with single, long, linked and the new double notes doing well to keep things varied and challenging, especially on harder difficulties and these partnered in with the more optional scratch notes make this rhythm game always feel involved as you’re never left using the same note type for too long. I always thought this system was pretty great as it was in Dancing All Night, so it’s good to see it’s just been tweaked and you can skip the tutorials in Dancing in Starlight if you played the previous Dance game. The screen has been neatened up, with only your current score visible at the top of the screen with the hype gauge and your progress with scratching Fever rings for approaching Fever events that trigger an ally to come and join in on the dancing fun is now displayed at the bottom of the screen, making it that little bit easier to focus on the rhythm game. It’s just as fun as the previous gameplay-wise and like its last game, its varying difficulty modes mean there’s something for rhythm game veterans, those who are here for more Persona 5 story and the people in between. In the background of this rhythm game is where the main difference between Persona 5: Dancing in Starlight and Dancing All Night is and that’s in its visuals. The character models of Persona 5’s cast are the best they’ve ever looked, with a higher frame rate and visual detail making all the character’s dances look smooth and natural and are a pleasure to look at in the background of its rhythm game. 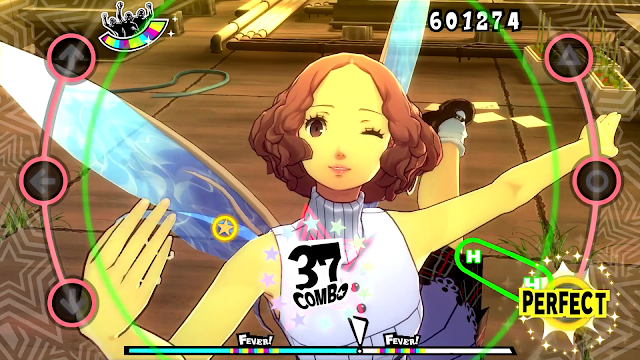 And the steps taken to improve the dancing itself is noticeable too, with each character’s dancing taking inspiration from their personalities, such as the graceful Haru incorporating ballet into her routines or the tough Makoto somehow smoothly adding moves in that look like she’s revving up her motorcycle. While the characters are dancing very well for people who aren’t pro dancers, the personality aspect makes it much more believable and truly shined when characters danced with each other in Fever moments that really showed their relationships well. Partnered with the slick and colourful sets based on Persona 5’s world and a few music videos using character models and also anime cutscenes from Persona 5, the overall visual appearance and dancing moments have really improved since the last Persona Dance game. Important in any rhythm game is its soundtrack and Persona 5’s genre-infusing one both in its original form and remixes work well in Dancing in Starlight. There are plenty of cool remixes that breathe new life into Persona 5’s already great soundtrack and there’s a lot of genres to enjoy, such as dance, dubstep, rock and its signature acid jazz style and I’m already itching for a soundtrack release outside of its special editions. Something great in Dancing in Starlight is how it made me appreciate some of the many battle and dungeon themes such as the boss battle track “Blooming Villain” or “Price” that worked well without any remixing and were tracks I wouldn’t have expected to work well as rhythm game tracks with choreography but ended up being some of my favourite to play. This makes its soundtrack feels more like a mix of game tracks and remixes compared to Dancing All Night’s more remix heavy one and really lets the quality tracks from Persona 5 shine in both their original and remixed forms and really made appreciate some of its tracks in a new way. 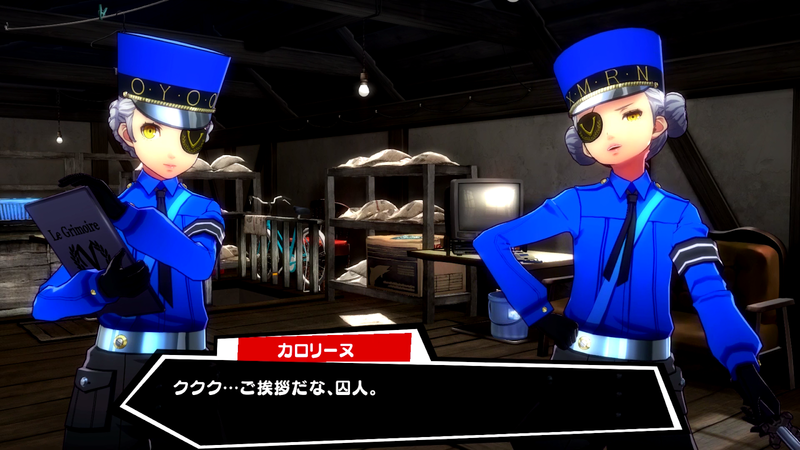 To break up the rhythm game and give us more time with Persona 5’s characters is Dancing in Starlight’s story events that many fans will be pleased to see due to their amusing content and getting more time with this great cast. These events are reminiscent of Persona 5’s confidant events, with each character having a certain amount of social events that are unlocked throughout the rhythm game progressively, with the main difference being unlocking them is more based on your rhythm game results rather than the actual conversations. These moments are of the quality you’d expect from Persona and give many funny and deeper insights into the characters and their dynamic with the protagonist along with each other, so even though the story aspect is smaller than Persona 4 Dancing All Night, the fun moments in Dancing in Starlight don’t disappoint. While I didn’t mind how these events are unlocked as a fan of rhythm games, the fact that these social events can only be unlocked by doing different things in the rhythm game portion may be hit or miss to players who are just playing for the story events. Some are easy, such as Ann’s events being unlocked by wearing a certain amount of costumes in songs, but others are more difficult, like Ryuji’s being based on the total number of combo notes you’ve accumulated in the rhythm game or Yusuke’s being based on the amount of Perfect notes you’ve done. This might sound difficult, but there are ways to make this easier like as playing songs on easy or using some of the unlockable game modes to manipulate the gameplay such as making going into ‘Fever’ mode easier. Ultimately, the rhythm game helps to unlock story moments and the story moments help unlock things like costumes and game modes to make the rhythm game more enjoyable, so as a fan of both rhythm games and Persona 5’s characters I found the way the two work together very enjoyable, but if you’re a fan of one of these aspects more than the other, it’s worth keeping in mind you can expect to play both modes in order to get the most out of either. There’s also a fun mini-game in some social events that allows you to interact with Persona 5’s environments and is where the game incorporates VR for those who have it. I don’t have VR, but thankfully you can play without it and I didn’t feel like I was missing out on too much as you are basically going through each room to learn more about a certain character with the analog stick while trying to find a hidden card. This mini-game was particularly enjoyable for how well-hidden each card was and it was always satisfying to find them after really looking through each room in detail, usually hidden within small crevices in these large rooms. If you don’t have a VR headset, this function works fine without and certainly isn’t something I’d go out and buy one for, but I can imagine if you have one being able to look up and down with your head in the 360 degree detailed environments could be cool and it seems like a good gimmick for those who already have a headset. After finishing all of Dancing in Starlight’s tracks for the first time, the amount of replayability will depend on how into its rhythm game you are. There are four different difficulty modes to unlock that provided me with the fun quest of beating some of its genuinely challenging songs, along with social events that unlock new costumes and game modes with challenges such as making notes invisible and with all these things being unlockables, it takes some time to get them all. I’ve played for around 20 hours and haven’t unlocked everything yet after finishing all of its songs on its hardest difficulty since I still have some social events to unlock, so if you like the rhythm game, you can probably expect to put a fair bit of time into it and since I do, I’m looking forward to playing more with it. Persona 5: Dancing in Starlight is the celebration of Persona 5’s soundtrack that it deserves. The mix of game tracks and remixes made me appreciate the soundtrack in a new way and the way characters personalities are portrayed both on and off the dance floor was something I appreciated as a fan of Persona 5. If you’re a fan of rhythm games and Persona 5’s story, there’s a lot to be satisfied with and although it's not as full in story content as the last Persona Dance game, there's still a fair bit to get through. As a rhythm spin-off game of an RPG series many know and love, Persona 5: Dancing in Starlight makes rhythm and story work well together in this great rhythm game twist on a fantastic JRPG. You can pre-order Persona 5 Dancing in Starlight in English at Play-Asia.com! 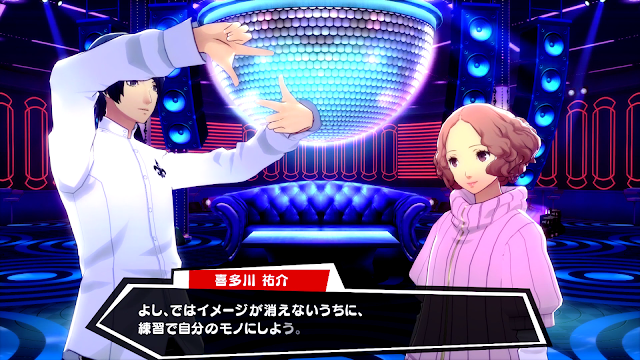 Will you play Persona 5 Dancing in Starlight when it gets localised? Have you already imported it?